Put almonds or bread into mixer bowl, mill for 15 sec/speed 9/MC on. Put garlic clove into mixer bowl, chop for 2 sec/speed 9/MC on. Put roasted capsicum and saffron into mixer bowl, chop for 3 sec/speed 8/MC on. Scrape bowl down and repeat. Insert whisk, put egg yolk, cayenne pepper and salt into mixer bowl, whisk for 1 min/37°C or 100°F/speed 1/MC on. Set mixer timer for 3 min/37°C or 100°F/speed 4 and slowly drizzle olive oil into mixer bowl. Set Rouille aside in the fridge before making the Bisque. Rouille is traditionally served as a garnish, spread on crusty baguette or spooned on with fish and fish soup but it is so delicious that you could serve it with meat. At step 1 mill for a little longer if your almonds aren't fine enough after 15 seconds. At step 4 and step 5 attach the butterfly and use 40°C or 105°F if you're using a Supercook. At step 7 use ST temp and speed 3 if using an Intelli, popping a tea towel over the steamer. If using a Supercook you'll need to use 130°C or 270°F and speed 4. At step 10 SLOWLY increase the speed from speed 4 to speed 9 for 1 minute. Prepare seafood and set aside, retaining prawn heads. It is better if your seafood is brought to room temperature before beginning. Without washing the bowl from making the Rouille, add garlic, parsley, basil, thyme and saffron to mixer bowl, chop for 3 sec/speed 9/MC on. Add leek, carrot and celery to mixer bowl, chop for 3 sec/speed 8/MC on. Scrape bowl down, add butter and saute for 8 min/100°C or 212°F/speed 2/MC Off. Add stock, bay leaf, tomato paste, tomato passata, honey and apple cider vinegar to mixer bowl. Insert simmering basket and put reserved prawn heads into the simmering basket. Cook for 20 min/100°C or 212°F/speed 3/MC on. Put mussels in the bottom steaming tray, with prawns layered on top. Place fish in a single layer on to top steaming steaming tray. Steam for 10 min/steaming temperature/speed 4 or until done. Remove seafood to thermal server to keep warm and finish cooking. Using tongs, pick out the prawn heads from the simmering basket and discard. Remove the simmering basket and put any left over "bits" into the mixer bowl. Add cream to mixer bowl and blend bisque for 1 min/speed 9/MC on. 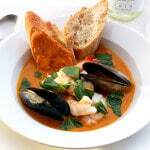 Serve bisque in a shallow bowl with seafood presented, fresh cracked pepper and freshly torn basil leaves. Spoon Rouille into the soup while eating or smeared on crusty fresh baguette. You can use whichever seafood you prefer, just adjust cooking times. Some types of firm white fish are blue eye trevalla, ling fish, monk fish, snapper and shark. I used blue eye trevalla. I recommend you prepare your seafood before you start cooking so that it has a chance to come to room temperature. Just made the bisque with what I had in the fridge. Leeks were substituted with spring onion and I added some capsicum for a punch, plus a red chilli. Was delicious with mud crab and barramundi. If u wanted to prepare in advance and leave warm in the thermoserver how long would you steam the seafood for ?? I made this just with prawns and fish and it was just awesome. Hubby threw out the prawn heads but next time I will use them. Such a yummy dish with all that goodness. Than you Nik for creating another Fantastic dish. Yet another recipie that is just awesome! I used a marinara mix to keep the cost down. Nik is not just about curries – but good flavoursome healthy foods. This is amazing and so versatile. Made it with prawns scallops and blue eye. The crusty bread and rouille is a must. Rouille is no extra effort and so worth it. Yum thanks Nik. I absolutely LOVED this recipe! Thank you so much for sharing. my 9 year old son (who enjoys good food) can not stop praising this dish! 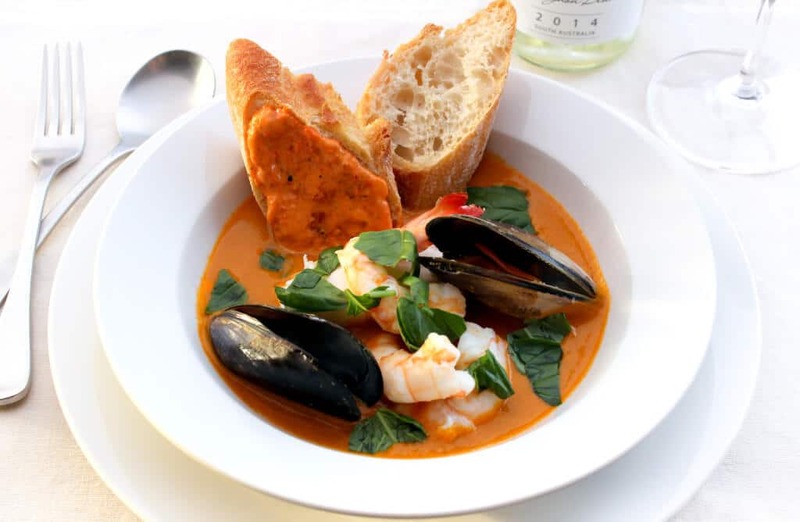 We have just finished gorging ourselves on the Skinnymixers Seafood Bisque with Rouille…if you haven’t tried it yet & are a lover of seafood – do yourself a favour & give it a go. After re-reading he recipe I forgot to add the leek, carrot & celery & it was still Devine! This was a delicious Seafood Bisque. I had some clams so added these as well. A perfect starter to impress friends at a dinner party. Thank you for all your hard work. Another skinnymixers clever recipe ! Enjoyed by 4 adults tonight, rouille is to die for, I skipped dessert and had more rouille on crusty bread after dinner! This is delicious. I have made it twice now. Once without the cream and both times it was amazing. Think I need to try it again !! I made this for dinner last night for myself and my seafood loving boyfriend and it was an absolute hit! We both loved the flavours and it was so easy to cook. 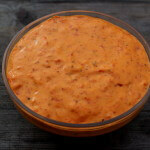 The rouille we spread on crusty bread but also used it as part of our antipasto platter too. Yum yum yum. Made this for Good Friday dinner and it was to die for. Everyone loved it. The only thing I changed was the chicken stock used veggie stock instead to elimate the meat. The best good Friday dinner ever. This was absolutely a restaurant quality dish. It took a little longer than I thought but mostly prepping seafood, Pesky mussels took a lot of scrubbing but loved the inclusion of them, They were delicious and added to presentation. I used ling fish and it was beautiful. Well worth the effort and judging by the sighs & orgasmic noises coming from hubby while eating, it was a definite winner. Made focaccia to accompany & dolloped some rouille on bread and a little to broth at the table. Good pinch of extra hot cayenne gave it a nice kick. Can’t praise this dish enough. Will definitely make again and be better organised with prep. This looks amazing! My kids (6,9 and 11)would love this (got some foodies here ), I would love this! Can’t wait try this out! SENSATIONAL!!!! We enjoyed the seafood bisque as our Good Friday dinner with friends. They were very impressed!! Served with a side Caesar salad (wink Nik) and raspberry fruity dream for dessert. Seriously the bisque was yum yum yum! Yum ! Made it for our Good Friday dinner and everyone loved it ! Another amazing recipe! Definitely worth getting a light tasting olive oil as our normal olive oil was a bit overpowering in the rouille. Still delish though! WOW!! This was amazing!! Looks like a lot of work but really the only hardish part was shelling the prawns. If you love a soup do yourself a favour and have a go!!! Made this meal tonight. Wow! It’s another winner. So tasty. I served it with crusty bread warmed in the oven. Just lovely. Perfect for a dinner party but simple enough to make on a weeknight too. Thanks for sharing.